Countless dogs have risked or sacrificed their lives to protect the people they care for. Their intelligence, devotion, and courage defy belief. Man's Best Friends shines a spotlight on soldier and service dogs, who protect and defend, often against great odds and at great peril, as well as the furry family members who would do anything to save the people they love in moments of crisis. 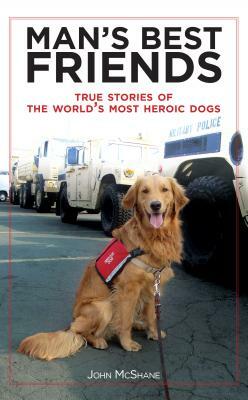 These are inspiring and captivating stories of canine bravery, heroism, and loyalty from around the world: from a military dog that discovered a German spy in World War I, to a guide dog that led a blind man to safety in the World Trade Center an hour after the attack on September 11, to an Australian cattle dog that rescued an 85-year-old Floridian woman from an alligator attack, to a yellow lab that learned how to use an ATM on behalf of a disabled veteran. From daring rescue attempts to simple acts of kindness, Man's Best Friends celebrates and reaffirms the unbreakable bond between Man and his Best Friend through these remarkably told and beautifully moving stories. John McShane is the author of Didier Drogba: Portrait of a Hero, Heath Ledger: His Beautiful Life, and Susan Boyle: Living the Dream, among other books. John McShane is the author of Didier Drogba: Portrait of a Hero, Heath Ledger: His Beautiful Life, and Susan Boyle: Living the Dream, among other titles.